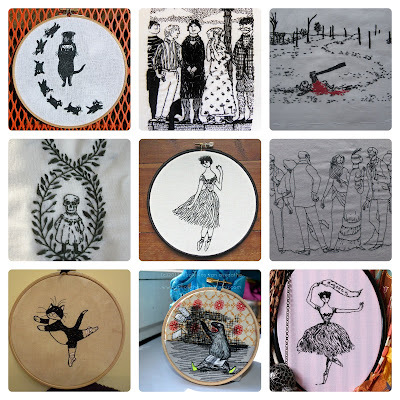 I am so impressed with the fabulous interpretations in thread of Edward Gorey's work that were posted in the Illustration Stitch A Long group! While being proud of my talented Stitch A Longers, I'm also slightly embarrassed that I didn't finish my own piece in time. I seriously underestimated the amount of embroidery work that tiny embroidery brought me, especially 'translating' the cross hatching in stitches. As soon as I'm done I will dedicate a post to my little Doubtful Guest embroidery. The mosaic really doesn't do the embroideries justice. You must click on the links above and view (and enlarge) the photos to be able to truly appreciate (and comment on) the great work the Stitch A Longers did. On the first of April our New Stitch A Long started. It's all about the art and animation movies of Tim Burton this time and Bridgeen (my co-host) and myself are counting on more fabulous work from you guys. Everyone is welcome to join our Stitch A Long group here! Yay! They look awesome all put together like that. I loved this SAL- it was great to see everyone's work, such a talented gang of stitchers. Have chosen my Burton image but need to finish up on some other things first!